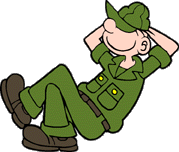 LOS ANGELES (AP) — Comic strip artist Mort Walker, a World War II veteran who satirized the Army and tickled millions of newspaper readers with the antics of the lazy private "Beetle Bailey," died Saturday. He was 94. In 2000, Walker was honored at the Pentagon with the Army's highest civilian award — the Distinguished Civilian Service award — for his work, his military service and his contribution to a new military memorial. for all the smiles and laughter you have given to everyone through out the years! Thanks for posting this wonderful article. Another one fades into the dust, but he left behind a lasting legacy! I saw this. I grew up on Beetle. .